The construction of a leisure park is one of the works that follow in the parish of Caniço. “It is an area that has a lot of population living in apartments and in fact needs a large space, a playground and recreation of children and the population in general,” said Miguel Albuquerque, within the framework of the ‘Madeira Commitment’ initiative, that took place today in that parish of the county of Santa Cruz. Miguel Albuquerque revealed that there is also a public tender for the Figueirinhas node, also mentioning the great bet that has been made in supporting schools and farmers, noting that Caniço is the largest producer of onions in Madeira. 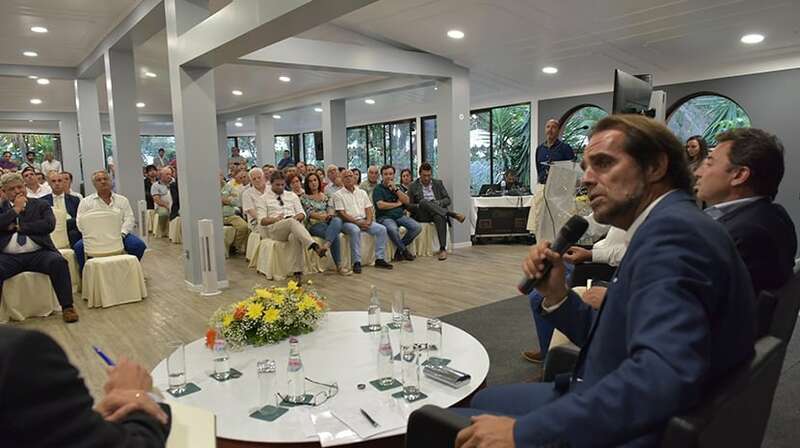 With a full room, the president of the PSD-M heard the concerns and answered the various questions raised by the militants, sympathizers and life forces of the parish of Caniço and the municipality of Santa Cruz, which will be of extreme importance for the implementation of the next program of Government. Asked about his relationship with the Municipal Council of Santa Cruz, Miguel Albuquerque stressed that regional and local elections can not be confused and recalled that, as candidate for President of the Government, won the elections in Santa Cruz. “People know me and know that we do not discriminate in any county due to political options and we are working for the well-being of the population of the county,” he said. He gave as an example the set of works that have already taken place in schools and will continue to be carried out.